These vineyard from the sub-regions of Baixo Corgo and Cima Corgo are planed on old vines and on platforms with different sun exposures and altitudes. After careful selection of grapes, the grapes are crushed smoothly and fully destemmed. Alcoholic fermentation is followed without skin maceration. The fermentation takes place under controlled temperature being stopped by the addition of wine spirit. The entire winemaking process, which is monitored by the oenology team, takes into account the grape verieties, their degree of ripeness and the desired sweetness. This wine is the result of a combination of young, fresh and fruity wines matured. 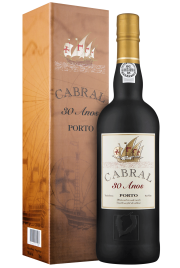 This port is fruity with more particularly notes of strawberries and raspberries. On the palate it is fresh, harmoniously fruity, elegant and seductive. This batch of wine is obtained from a blend of young, fresh and fruity wines passing through a minimum aging period. This wine is ready to eat and does not need decantation. A brand new port Rosé with finesse and modern style. Ready to be consumed; Does not need to be decanted. Serve at a temperature between 10-12°C as an aperitive or combined with tonic water. It is also suitable for desserts such as creams and red fruit tarts. Consume preferably in 2 to 3 months after opening.